Minister of Natural Resources and Environment Tran Hong Ha has proposed an emergency solution to avoid further devastation in the aftermath of the landslide that destroyed 14 houses last month in Mekong Delta An Giang Province. The accident site where 16 houses collapsed following a landslide on April 22 in Chợ Mới District, An Giang Province. The use of gabions, wattle screens, bamboo, wooden poles and sand packs was one of the emergency solutions proposed to the Prime Minister after the environmental minister completed a field trip to the devastated area on April 25-26. Hà proposed to cover the damaged road, located along the Hậu River, where 16 houses collapsed, with gabions, wattle screens, bamboo, wooden poles and sand packs to increase its endurance against the high water velocity and force as a result of the waterway traffic, preventing the occurrence of landslides in residential, production areas and near schools. He also said the provincial People’s Committee would immediately relocate residents of the devastated area and support them in finding a stable means of livelihood. Non-structural solutions such as dredging the Hau River and adjusting its flow should be implemented in co-ordination to avoid creating vortexes near riverbanks and sudden minimisation of the discharge area, he added. In addition, local authorities should tighten inspection of construction near the river, sand exploitation in the river and water traffic. Proper sand exploitation will also open up the river’s flow and prevent landslides, he said. The minister said extensive research should be conducted to develop effective specifications to build embankments and river works to adjust river flow. Regarding a long-term solution, the minister proposed that the Prime Minister either approve of the projects under a national target plan on responding to climate change and green growth as soon as possible or give permission to implement an anti-landslide project along the Hau River in advance. He also proposed that the Ministry of Natural Resources and Environment and the Ministry of Agricultural and Rural Development collaborate with local authorities to conduct comprehensive and systematic surveys, inspections and evaluations of the causes of landslides near the Hau and Tien rivers in the province, based on which a co-ordinated plan to observe and protect the region could be prepared. 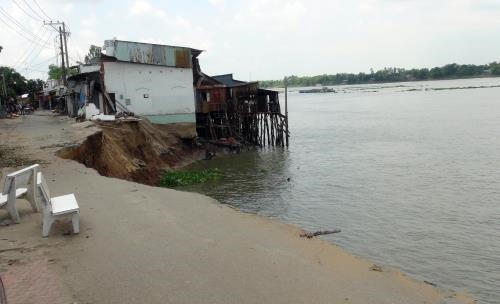 Fourteen houses and two house floors in My Hoi Dong Commune, Cho Moi District of An Giang Province fell into the Hau River on April 22 due to a landslide, forcing some 100 households to relocate. The 70m landslide resulted in estimated total damages of VNĐ8.8 billion (US$391,000). There were no deaths. Another house, adjacent to the devastated fleet, collapsed on Thursday morning due to landslide.